Jimmy Buffett has created a world of his own. His best known hits, “Margaritaville” (1977), “Cheeseburger In Paradise” (1978) and “It’s Five O’Clock Somewhere” (a 2003 duet with Alan Jackson) celebrate an “island lifestyle” of never-ending cocktails, clambakes and carousing by the coast. Buffett has somehow insulated this essentially transient, beach-bum worldview from the passage of time and the encroaching demands of middle-age. Now well into his sixties, he has maintained the freshness and popularity of a musical formula which he invented on his major label album debut, A White Sport Coat And A Pink Crustacean, all the way back in 1973. Since then, in a remarkably consistent career, Buffett has achieved US platinum status for sales of albums including Changes In Latitudes, Changes In Attitudes (1977), Son Of A Son Of A Sailor (1978), Fruitcakes (1994), Banana Wind (1996) and Licence to Chill (2004). And he has toured every year from 1976 to the present with his Coral Reefer Band, performing in beach shorts and bare feet to a legion of fans known as “Parrotheads” who have continued loyally to follow him, sometimes over successive generations in the same family. James William Buffett was born on December 25, 1946 in Pascagoula, Mississippi. He grew up in Mobile, Alabama and graduated with a degree in History from the University of Southern Mississippi. After working as a correspondent for Billboard magazine in Nashville, he started his musical career as an acoustic singer-songwriter with a couple of independently released albums, recorded at the start of the 1970s, that gave little indication of the unique musical persona for which he later became known. In 1971 Buffett went on a busking expedition to Key West in Florida, a place that later became his home and which exerted a telling influence on his musical outlook. The tropical climate and relaxed, hedonistic lifestyle of the area inspired Buffett to start writing songs that eventually begat his own personal genre known as “Gulf & western”, denoting a combination of country (music) and Gulf Coast (lyric and narrative) influences. The first examples of this distinctive hybrid appeared - along with the first incarnation of the Coral Reefer Band - on Buffett’s album A White Sport Coat And A Pink Crustacean, released in 1973. The best-known song from the album, and one of the most notorious, was “Why Don’t We Get Drunk (And Screw)”, a plain-talking, albeit throwaway ditty which celebrated a lifestyle notable for its casual indulgence and heroic lack of political correctness. The theme was expanded on “God’s Own Drunk”, a song written by Lord Richard Buckley, which featured on Buffett’s next album, Living And Dying in 3/4 Time, released in 1974. The album also housed “Come Monday”, Buffett’s first hit single which reached US No.30 and featured in his set list for many years thereafter as one of “The Big 8” – the eight songs which Buffett has nearly always played at his many live shows over the course of his long career. Buffett also enjoyed his first significant success in the album chart later the same year when A1A reached US No.25. The album cemented the Key West geographical connection, Route A1A being the road that runs through many of the beachfront towns in Florida State. It was notable for the song “A Pirate Looks At Forty”, a rumination on a misspent life which became another of The Big 8. While Buffett made no apparent advances artistically or commercially with his 1976 album Havana Daydream, he had nevertheless refined his unique formula to something close to perfection by the time he came to release Changes In Latitudes, Changes In Attitudes in 1977. This was the collection which earned him his mass market breakthrough and remains the best-selling studio album of his career. It housed “Margaritaville”, the biggest of The Big 8, and the track which more than any other defined Buffet’s philosophy and enduring appeal. Named after the tequila-based margarita cocktail, the song describes in exquisite detail the mixed feelings of whiling your life away in an alcoholic haze of sun-soaked downtime. While scrupulously non-judgmental, Buffett’s lyric subtly suggests that it might pay to be careful for what you wish as the singer finds himself “Wasted away again in Margaritaville/Searching for my lost shaker of salt”. “Margaritaville” also gave birth to an industry. In 1985, Buffett opened the first Margaritaville themed restaurant in Key West, the singer’s adopted hometown, where he has long enjoyed (unofficial) dignitary status. Today the Margaritaville chain stretches from New Orleans to Nashville with overseas franchises as far afield as Mexico, Australia, the Caribbean and other locations where the climate is suitably welcoming. There have since been Margaritaville hotels, Margaritaville casinos and Margaritaville retail outlets selling a vast range of clothing, fashion, jewellery, home entertainment and other merchandise. And, of course, the Margaritaville record label. Buffett may have embraced the slacker lifestyle in his songs, but he did not sit around when it came to capitalising on his business opportunities. Nor was he slow to follow up on the success of Changes in Latitudes… with his next album Son Of A Son Of A Sailor, which peaked at US No.10 in 1978. This album introduced the world to “Cheeseburger In Paradise”, a song which would later gave its name to a culinary delight on the menu of the Margaritaville restaurants and then a “casual dining restaurant chain” which started up in the US in 2002. Buffett ended the 1970s with Volcano (1979) a US No. 14 hit which generated another two of the Big 8: “Fins” and the title track. Maintaining an incredible work rate by any standards, never mind those of such an apparently workshy performer, Buffett released a new album every year during the 1980s (bar 1987). 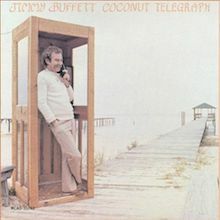 Coconut Telegraph (1981) gave its name to a newsletter mailed out to a worldwide subscriber list of Buffett fans, the so-called “Parrotheads”, which has remained one of the most dedicated fan bases in the history of pop. Buffett’s first compilation album, Songs You Know By Heart, released in 1985, has sold seven million copies in the US. Having secured his position as a highly successful songwriter, musician and entrepreneur, Buffett added a literary strand to his career – and immediately became a best-selling author too. His first collection of short stories, Tales From Margaritaville: Fictional Facts And Factual Fictions, published in 1989, lodged in the New York Times best-seller lists for seven months. He followed this with a similarly successful full-length novel Where Is Joe Merchant? (1992) and a personal memoir, A Pirate Looks At Fifty (1998), which topped the New York Times list and sold half-a-million copies in hardback. At the same time, he continued to hit the musical heights with a string of platinum and gold albums including Fruitcakes (1994), Barometer Soup (1995), Banana Wind (1996), Don’t Stop The Carnival (1998) and Beach House On The Moon (1999). Still he wasn’t done. Indeed, Buffett saved some of his most successful work for the new millennium. His million-selling single with Alan Jackson “It’s Five O’Clock Somewhere”, a knockabout endorsement of lunchtime boozing, released in 2003, was a classic statement of core Buffett values (albeit written by Jim Brown and Don Rollins). The success of the song paved the way for License To Chill (2004), an album released on RCA Nashville and comprised primarily of collaborations with various country artists, including Alan Jackson (“Boats To Build”), Martina McBride (“Trip Around The Sun”) and George Strait, Clint Black, Kenny Chesney and others on a version of Hank Williams’s “Hey Good Lookin’”. According to Allmusic.com “These guests not only give Buffet a straight man for his jokes, but also help focus his musical direction, since it all feeds into the album’s sun-kissed contemporary country direction.” License To Chill became Buffett’s first and only US No.1 album (so far), while a follow-up album of (mainly) cover songs, Take The Weather With You (2006), also on RCA Nashville, topped the country chart and reached US No.4. But you still wouldn’t bet against Buffett getting to the top again – of any tree he sets out to climb. 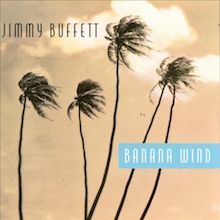 Banana Wind is typical latter-day Jimmy Buffett. Over a laidback, Caribbean-inflected folk-rock, Buffett waxes eloquent over boats, booze, sun, and women. Although the sound of the album certainly is pleasant, there's not a single distinctive song on the record, which means it's good for Parrotheads, but casual fans should let this Banana Wind sail on by. One reason why Jimmy Buffett's sixth album, Changes in Latitudes, Changes in Attitudes, is his best record yet is simply the sound. Buffett's move from Don Gant, who produced his last four albums, to Norbert Putnam is a serious upgrade. Putnam, a bassist by trade with a talent for string arranging, specializes in working in Nashville with artists who don't quite belong in Nashville. His production of Eric Andersen's Blue River resulted in a masterpiece, and he's done quality work with the likes of Joan Baez, Neil Young, and Dan Fogelberg, creating a country-pop sound that achieves the crossover such artists crave. Putnam is a perfect fit for Buffett; he gives the music the polish Buffett's always needed. But that only explains the reason why the album works so well sonically. The main reason it's Buffett's best is the songs, most of which he wrote. Buffett has always been a good songwriter when he had the time to apply himself, and he's been developing a persona that reaches its culmination here. Or, it might be said that the persona takes a logical next step. Buffett's alter ego is something of a screwup, a guy who's on the road, sometimes defined as a traveling musician, and who fuels himself on liquor and recreational drugs. He wants to get home to his loved ones, but he's actually not in that much of a hurry to do so. The guy who sang "Come Monday" in 1974 ("I just want you back by my side") has evolved into someone who's been on the road so long that he and his pals "Wonder Why We Ever Go Home." He may, as he claims, "Miss You So Badly," but he also acknowledges, "The longer I'm gone the closer I feel to you." When he is at home, he is clearly at loose ends, and this is where Buffett's observations are most acute, as he leads off the LP's two sides with its two best songs. The title tune finds him world-weary yet ready to head off again. "If I wasn't crazy I would go insane," goes the chorus. And the culmination of it all comes on the irresistibly catchy, completely self-deprecating "Margaritaville," a guitar-strumming beach bum's declaration of purpose (or purposelessness). He can't remember how he got a new tattoo, he has cut his foot on the "pop top" of a beer can, and his heart seems to have been broken some time in the past (he doesn't seem to remember all that well), but soon his blender will finish stirring up his favorite drink and all will be well. The song is an anthem for the Buffett character and likely to prove an archetype. 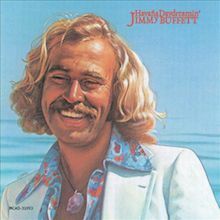 After his debut with 1970's Down to Earth, Jimmy Buffett released an album a year from 1973 to 1977, culminating with his commercial and artistic breakthrough, Changes in Latitudes, Changes in Attitudes, which apotheosized his beach-bum persona in its hit single "Margaritaville." A year later, he's back with his seventh album, Son of a Son of a Sailor, but things have changed. 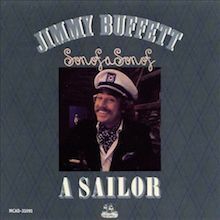 Now, Buffett has a high-profile manager in Irving Azoff (who is dressed like Napoleon in the high-fashion photo spread across the gatefold of the LP), and as his smiling, well-upholstered image on the cover shows, he's not a beach bum anymore; now he looks like the happy owner of a yacht. Accordingly, he isn't writing songs like "Margaritaville" anymore, either. The closest approximation to that is "Cheeseburger in Paradise," which might as well be a commercial jingle for a fast-food chain. The locus of the songs still tends to be in the Caribbean, the characters still lowlifes, but the personal touch is missing. Buffett is writing fiction now, and the edge is off. Having achieved the perfect expression of his world-view the last time around, and profited handsomely as a result, he is now no longer funny in a self-deprecating way that makes his songs touching. He was never one to take himself too seriously, but now he's veering toward self-parody. By the time of his fifth album, Havana Daydreamin', Jimmy Buffett seemed to have established a pattern for what a collection of his songs would be. The best one-word description for the musical style still would have to be "country," but Buffett, and probably his record label, had given up on trying to sell him to the conventional country audience, and instead aimed at a slice of the pop market. That was fair enough, since he had evolved a persona as a Gulf Coast ne'er-do-well in compositions full of sentimentally viewed oddball characters ("Woman Goin' Crazy on Caroline Street," co-written with Steve Goodman, a re-recording of "The Captain and the Kid" from his first album, Down to Earth), self-deprecating self-portraits ("My Head Hurts, My Feet Stink and I Don't Love Jesus"), and humorous depictions of life on the road for the working musician ("Big Rig," written by Gregory "Fingers" Taylor, harmonica player in Buffett's Coral Reefer Band, "Kick It in Second Wind," co-written with girlfriend Jane Slagsvol), with plenty of references to alcohol and recreational drugs thrown in. It was perhaps unfortunate that the two best-written songs on the album, each of which ended one side of the LP, were written by others, Jesse Winchester's touching, whimsical "Defying Gravity" and Steve Goodman's road song "This Hotel Room." But that suggested that Buffett was looking for good songs to sing, whether he wrote them himself or not. After breaking into the mainstream with his hit "Margaritaville" two years earlier, Jimmy Buffett stuck to his formula of mixing fun, up-tempo songs with slower, reflective ones. Although the album contains concert favorites including the playful "Fins" and the Caribbean-flavored title track, it seems as if Buffett doesn't have as many deep insights to share on this release. The vocal help from James Taylor on "Treat Her Like a Lady" adds to the singalong chorus, but overall the ballads are uninteresting. 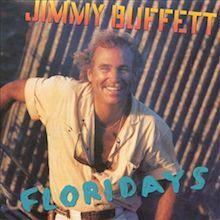 As a result, this album marks a low point for Jimmy Buffett in a decade in which he delivered one solid album after another. However, Volcano is notable for its inclusion of a wonderful children's song ("Chanson Por les Petits Enfantes"), complete with nursery rhyme lyrics. This album is for Parrotheads only, as most of the popular tracks are available on compilations like Songs You Know By Heart. Combining aloof humor with a laid-back, devil-may-care island attitude, Jimmy Buffett sang songs about alcohol consumption, lazing around in the sun, and the freedom of not having to work for a living. Songs You Know By Heart is a solid offering of Buffett's greatest hits, pulling together his truly strongest material and avoiding the unnecessary filler that appears on his albums. His claim to fame, "Margaritaville," is the jewel in the crown here, which still harbors that tropical feel thanks to its Caribbean-styled rhythm and relaxed flow. "Come Monday" picks up where "Margaritaville" leaves off, only this ballad plays out with subdued sincerity and has Buffett sounding strangely serious, and romantic. Most of the songs from Buffett are centered around his frolicking lifestyle, like the comical "Cheeseburger in Paradise" or the naughtiness of "Why Don't We Get Drunk," an ode to his party-filled outlook on life. Buffett's voice shines on the clever "Changes in Latitudes, Changes in Attitudes," which again spotlights his love of living without concern, especially in someplace warm. The catchy and whimsical "Fins" is lifted by a contagious pace with a smart chorus and serves as one of the highlights of this collection. As a compilation, this bunch of Jimmy Buffett's most famous tunes contains just the right amount of tracks. Any less would be inconsistent and any more would be deemed as overkill. 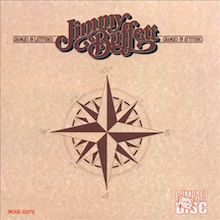 In a sense, Jimmy Buffett has succeeded by inventing his own audience rather than addressing an existing one, carving out a hybrid style that is true to his Mobile, AL, roots with a musical style mixing pop, folk, and country with Caribbean elements and a lyrical persona as an easygoing Gulf Coast layabout addicted to sunshine and alcohol (with a few drugs thrown in). Since his breakthrough with "Margaritaville" in 1977, he has enjoyed four consecutive gold or platinum albums. If Coconut Telegraph continues that sequence, it won't be because he has fiddled with the formula. This is another collection of songs mostly written by Buffett and his friends (including Mac McAnally, J.D. Souther, and Dave Loggins) that continue to extol the lazy wonder of living well lubricated in tropical climates. To a certain extent, Buffett seems to acknowledge that he is selling a fantasy, in "Incommunicado" (which he wrote with Deborah McColl and M.L. Benoit) referencing the Travis McGee character in John D. MacDonald's mystery novels and John Wayne's portrayals in the movies. But he also gets across the implied arrogance of his stance in McAnally's "It's My Job," in which the songwriter defends himself as "better than the rest." That aspect is soft-pedaled, however, lest it be off-putting. Most of the time, Buffett is playing things for laughs in songs with titles like "Growing Old But Not Up" and "The Weather Is Here, Wish You Were Beautiful." That's just how his large cult likes things, and Coconut Telegraph was made to service them. Before Jimmy Buffett became a novelist, entrepreneur, and founder of a business empire, he was a prolific singer/songwriter and a great storyteller. In the song "Migration," which chronicles his failed first marriage and his subsequent move to Florida, he sings "I got a Caribbean soul I can barely control and some Texas hidden here in my heart." This perfectly describes the music of Jimmy Buffett, who incorporates steel drums, harmonica, and slide guitar to tell stories about life by the sea. While many of the songs for which he is famous involve a life of leisure told with a keen sense of humor, Buffett is more thoughtful than your average beachcomber. 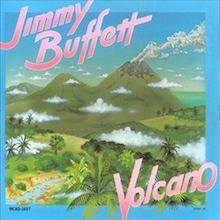 In fact, the best moments on this album are the slower tunes such as "A Pirate Looks at Forty" where a reflective Buffett looks back at his lifelong love of the ocean and his place in the universe. A-1-A may be Buffett's most autobiographical album, as he sings about making music on his own terms in the opening up-tempo "Makin' Music for Money" and tells stories of his idyllic childhood in "Life Is Just a Tire Swing." As with most of Buffett's work, his stories convey the importance of enjoying life, living free, and doing as you please. This is one of Jimmy Buffett's classic '70s albums that established his persona, and it is a perfect introduction to his music. The best thing about Jimmy Buffett's Fruitcakes is the perpetually over-served Key Wester's Howard Beale impersonation on the album's title track. Like many of us, Buffett is angry about enormous movie theater sodas, crazy people walking around with mud in their eyes, and the screwy nature of modern religion and relationships. His gripe is delivered via a half-spoken ramble over a typical Caribbean lope that's as forgettable as it is recognizable. The song works not because it rehashes the same temperate groove, but because Buffett's rap sails so close to the infectious on-stage persona that's become his five-star meal ticket in recent years. The album's other standouts work for the same reason. 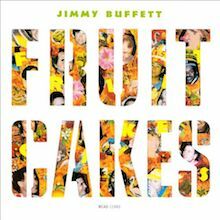 A pastel cover of the Grateful Dead's "Uncle John's Band," the jaunty "Vampires, Mummies and the Holy Ghost," and "Lone Palm," which looks at life from under just such a tree, all ring with that faded T-shirt vibe so prevalent in Buffett's best work. Along with the touching daughterly tribute "Delaney Talks to Statues," these slices of Fruitcakes further the fantasy of landlocked Parrotheads everywhere, the one that makes that final margarita okay, banishes winter to an old tin can, and shakes white sand into every crevice of the office cubicle. Earnest ballads like "Love in the Library" are nice, but Buffett's cheeky rhymes and effectively simplistic playing just can't support them with the sophistication -- or seriousness -- they deserve. His Panama Jack pirate act is a one trick pony, no question. But it has limitless legs and is continually sold on the fact that everyone wants to be Jimmy Buffett some of the time. Fruitcakes' most memorable morsels make this wish come true, if only for a few surf-soaked minutes. Apparently, Jimmy Buffett's rapprochement with Nashville is over. After two albums (Riddles in the Sand and Last Mango in Paris) that produced six country chart singles entries between 1984 and 1986, Floridays finds the singer/songwriter parting ways with the production team of Jimmy Bowen and Tony Brown, but sticking with third co-producer Michael Utley (who is also the keyboard player in his band and a sometime songwriting partner) with himself installed as executive producer. And the musical style, as can be heard from the beginning of the opening track, "I Love the Now" (co-written by Buffett and Carrie Fisher), is pop/rock with a Caribbean tinge. 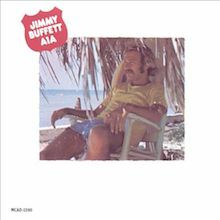 Buffett sometimes alters that style to accommodate the theme of a particular song, giving a Brazilian feel to "First Look," which is about visiting Rio, and a full-on Stax Records R&B arrangement, appropriately enough, to "Meet Me in Memphis." But this is a record by Jimmy Buffett in his familiar soft rock mode, not Jimmy Buffett the country crossover candidate. And that's a good idea, since Floridays is one of his more personal and self-reflective efforts, full of songs in which he waxes nostalgic ("Creola") or updates of old themes ("Nobody Speaks to the Captain No More"). As he did with "It's My Job," he finds another songwriter to pen the album's most self-justifying song, "If It All Falls Down," giving him plausible deniability if anyone takes offense. And he returns to bashing the entertainment industry in the comic closer, "You'll Never Work in Dis Bidness Again." Of course, he is at least partially serious about that. The album sleeve contains a notation at the bottom reading, "Fifteen down and one to go." What does that mean? 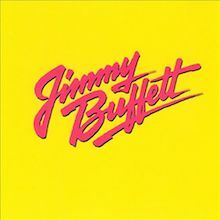 Well, if you count the live album Feeding Frenzy and his greatest-hits LP, this is Buffett's 15th album for the label once known as ABC/Dunhill and now as MCA. Does he have only one record to go on a contract he doesn't plan to renew? So it would seem. Wonder if the folks in the marketing department at MCA have noticed the note and, if so, how it makes them feel about promoting Floridays. You'd think, with an attitude like that, Buffett might just be cruising (as he has been accused of doing on occasion). But Floridays is actually one of his better albums. Go figure.